Using JfreeChart To Plot Charts In Java is a skill every Java Programmer should have. Jfreechart is a free 100% library that helps Java Developer display Graphs on their applications, it is open source and distributed under the GNU General Public licence (They permit the of proprietary applications). Jfreechart can help you draw and display a vast range of chart types i.e Pie Chart, Line Chart, Time Series Chart etc. The Chart can also be exported to an image file i.e. png, jpg or a Vector Graphics file formats (pdf, eps ,svg). After successfully adding the above jar files to your library, you can proceed for proper implementation. The method addValue contains 3 parameters, the first parameter is the data on the Y axis, The second parameter is the plot ID ad the third parameter is the data on the X axis (represented as a String). After all data has been added to the dataSet objects, the system can began to plot the Graph, the dataset object will be passed to a method above as one of the parameters (the setChart method above returns a bufferedImage object Which can be attached to jlabel to be displayed as an Image). 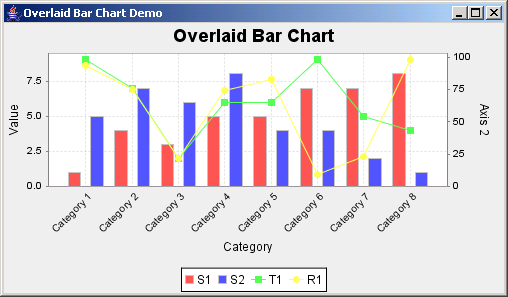 The setChart method above uses the ChartFactory static class to create a jFreeChart Object, the creatLine method has parameters that set the chart tile, x-axis label, y-axis label, inserts dataset etc. After the chart object is created it is then design, transformed into a BufferedImage and returned to the calling method.